This powerful meme circulates from time to time: "The holocaust was legal. Slavery was legal. Segregation was legal. If you use the state as a metric for ethics, you're going to have a bad time." It's a sobering reminder that we must be vigilant to examine the status quo -- even when it's enshrined in law. 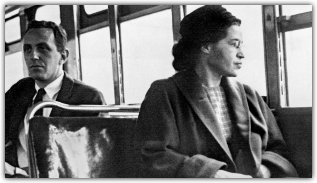 Today most of us shudder to think that Rosa Parks (pictured above) would be expected, even legally required, to forfeit her seat on public transportation to an able-bodied man just because he was white and she wasn't. Such an expectation offends our sensibilities. It's just not right! But in 1955, predominant culture proclaimed, "That's the way it is. Things can't be changed. Follow along or .... be arrested ... be vilified ... promote scandal ... ruin life for everyone else ... destroy the fabric of society...." You get the idea. As Christ-followers, we must recognize the biblical call for the community to care for the vulnerable: the widow, the orphan, the alien, the poor. In Luke 4.18-19, Jesus publicly lays out his own mission statement "to proclaim good news to the poor ... to proclaim freedom for the prisoners and recovery of sight for the blind, to set the oppressed free, to proclaim the year of the Lord’s favor.” Read that slowly. Jesus' God-breathed mission focused on bringing help and hope to the vulnerable. It remains a call to all of us who follow him. If law or cultural practice excludes people, deprives some persons of rights or power or dehumanizes a subset of the community, we Christ-followers can and must call it into question. Not convinced? Feeling sure we must "defend" or hold others to a biblical standard at all costs? Re-read the Gospels. When someone's life or practice varies from a biblical standard (say, an adulteress; tax collector; a leper; a demon-possessed person; people of other faiths like the Samaritans), how do the Pharisees, the ardently religious people of Jesus' day, respond to that person? How does Jesus respond to that person? And just who should we try to emulate? Friends, let's live like we get it. What Are You Doing for Jesus' Sake?